North Carolina has a historic chance to be the 38th — and final! — state to ratify the Equal Rights Amendment (ERA). Join us as we bring that message to our legislators. We need them to know that North Carolina wants equal rights for all – women and men! #ALLforERA One more state. Not one more genERAtion. ERA Advocacy Day on 1/30/19. Organized by the ERA-NC Alliance of which NC NOW is part. If you’re on facebook, join the Facebook event and let us know you are coming! 9:30 am – Gather on the 1st floor, 1300 quadrant to the left as you enter the building, Jones Street entrance. Receive instructions. 10:00 am – 12:30 pm Distribution of 170 copies of ERA advocacy cards and DVDS to legislators (120 House, 50 Senate). Colors: Let’s make a sea of green! Wear ERA-NC Alliance t-shirts or other green and white apparel or lapel ribbons if you are able. 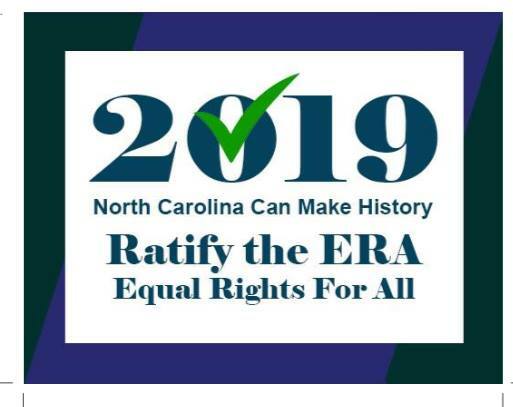 This entry was posted in At NCGA, empowerment, Equal Rights Amendment, ERA, women and tagged Equal Rights Amendment, ERA, ncga, women. Bookmark the permalink.